2 ICC should be developed in its five spheres: Intercultural attitudes / savoir être: Curiosity, openness, the affective ability to decentre, which implies abandoning ethnocentric attitudes and relativising ones own values, beliefs and behaviours. Knowledge / savoirs: of ones own culture and of the interlocutors culture and of how human beings interact and perceive each other. Skills of interpreting and relating / savoir comprendre: ability to interpret a document or event from another culture and relate it to similar documents or events in ones one culture. Skills of discovery and interaction / savoir apprendre - faire: ability to acquire new knowledge of a culture and cultural practices; ability to operate knowledge, attitudes and skills under the constraints of real-time communication and interaction. Critical cultural awareness / savoir sengager: the critical evaluation of practices, perspectives and products in ones and the others culture and countries. 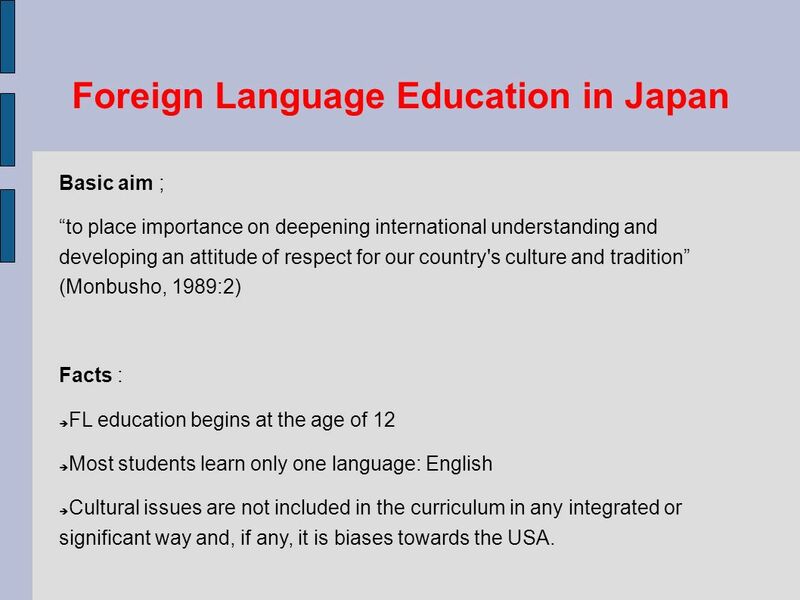 3 Foreign Language Education in Japan Basic aim ; to place importance on deepening international understanding and developing an attitude of respect for our country's culture and tradition (Monbusho, 1989:2) Facts : FL education begins at the age of 12 Most students learn only one language: English Cultural issues are not included in the curriculum in any integrated or significant way and, if any, it is biases towards the USA. 4 2002 Reforms and FLTin Japan Underlying principle – internationalization English – Compulsory – emphasis on practical communication skills Introduction of integrated study time to the curriculum. (IST) The IST content is to be decided at individual school level. 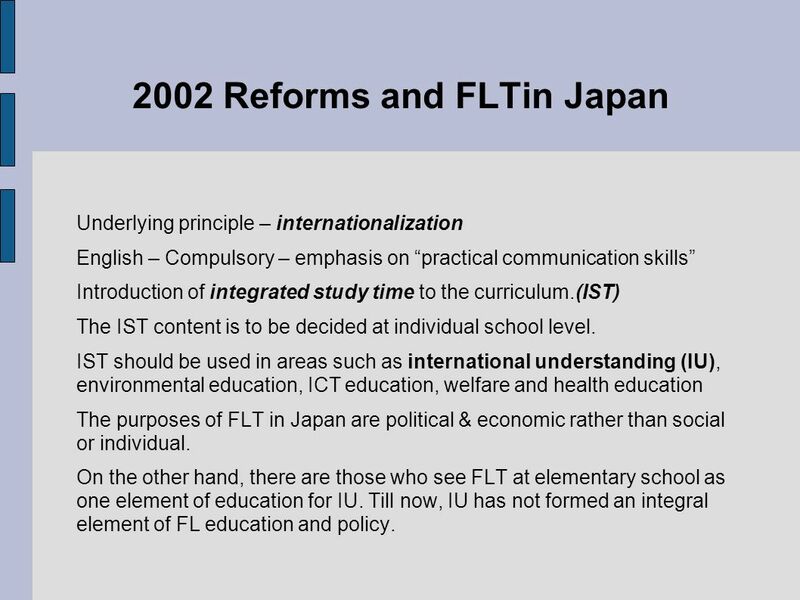 IST should be used in areas such as international understanding (IU), environmental education, ICT education, welfare and health education The purposes of FLT in Japan are political & economic rather than social or individual. On the other hand, there are those who see FLT at elementary school as one element of education for IU. Till now, IU has not formed an integral element of FL education and policy. 5 NHK (Japan Broadcasting Company) Project NHK has developed an English programme to be used by elementary schools in their integrated study time. NHK intend to include a significant proportion of cultural content. Cultural content is organized to fit in with and complement the key expressions and functions. English is recognized the lingua franca which includes English communication with people whose native language is not English (international understanding perspective). 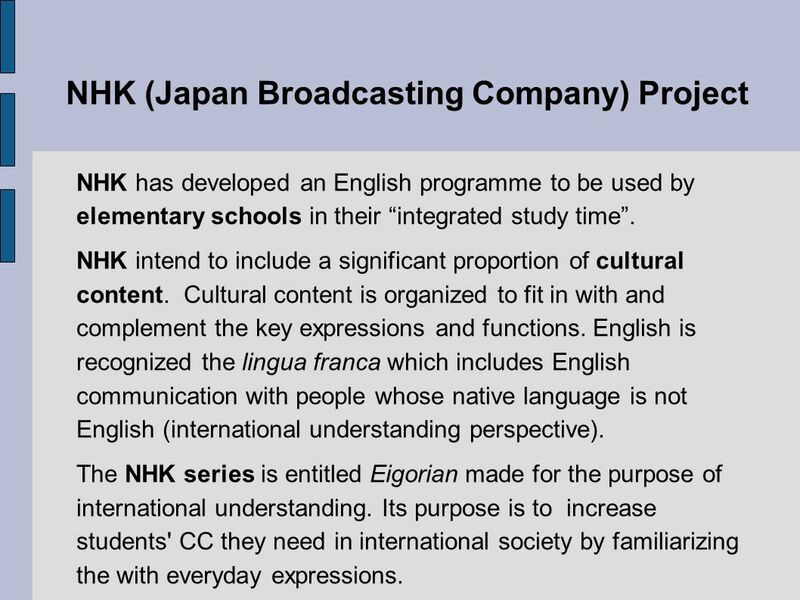 The NHK series is entitled Eigorian made for the purpose of international understanding. Its purpose is to increase students' CC they need in international society by familiarizing the with everyday expressions. 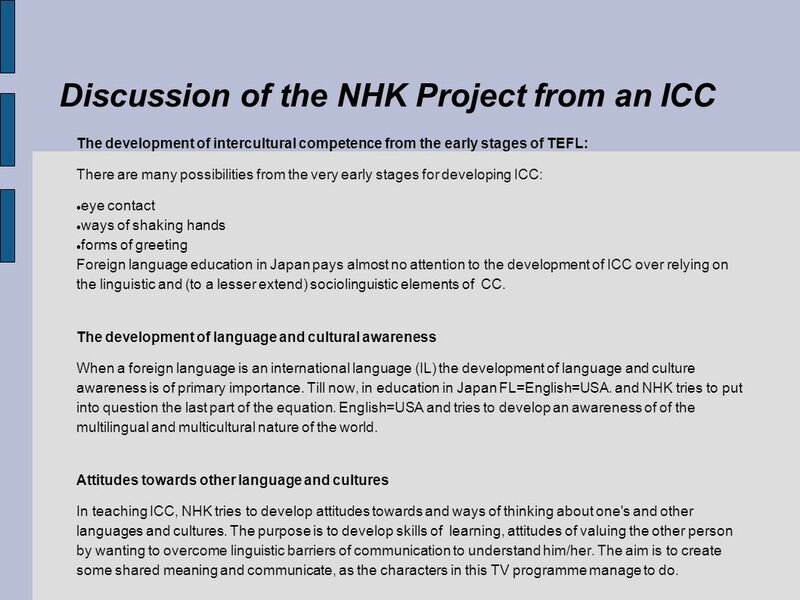 6 Discussion of the NHK Project from an ICC The development of intercultural competence from the early stages of TEFL: There are many possibilities from the very early stages for developing ICC: eye contact ways of shaking hands forms of greeting Foreign language education in Japan pays almost no attention to the development of ICC over relying on the linguistic and (to a lesser extend) sociolinguistic elements of CC. The development of language and cultural awareness When a foreign language is an international language (IL) the development of language and culture awareness is of primary importance. Till now, in education in Japan FL=English=USA. and NHK tries to put into question the last part of the equation. English=USA and tries to develop an awareness of of the multilingual and multicultural nature of the world. 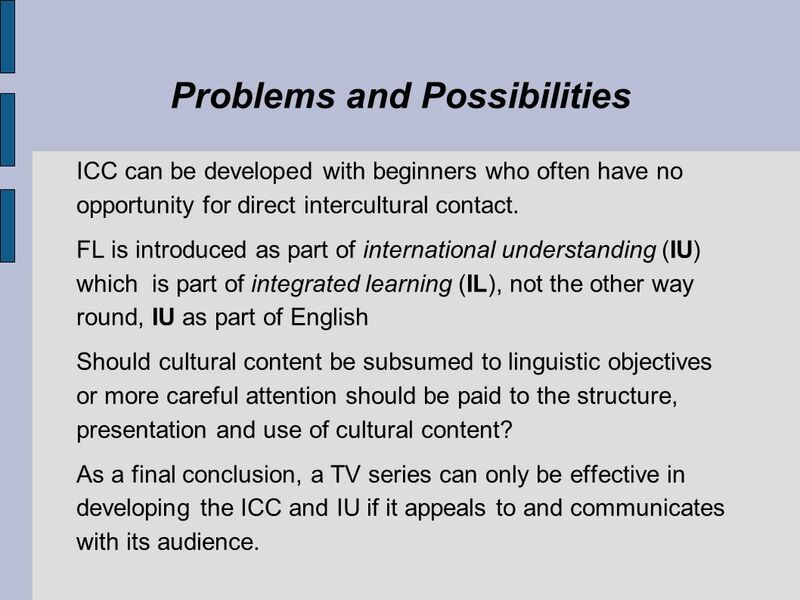 Attitudes towards other language and cultures In teaching ICC, NHK tries to develop attitudes towards and ways of thinking about one's and other languages and cultures. The purpose is to develop skills of learning, attitudes of valuing the other person by wanting to overcome linguistic barriers of communication to understand him/her. The aim is to create some shared meaning and communicate, as the characters in this TV programme manage to do. 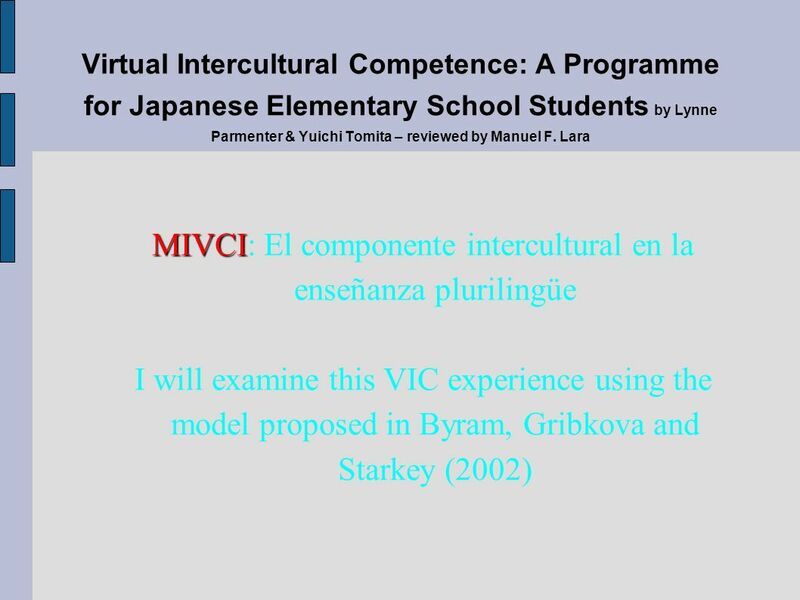 Download ppt "MIVCI MIVCI: El componente intercultural en la enseñanza plurilingüe I will examine this VIC experience using the model proposed in Byram, Gribkova and." Cultural and National Aspects of Using Films in EFL Environment Dana Kabylbekova Suleyman Demirel University Almaty, Kazakhstan. Global Convention on Language Issues and Bilingual Education Singapore 2006. Intercultural communication Synthesis of the Year One Report. ADAMS Adeline – M2 RET /13 Language and culture. Lecturer: H. Cindy Lee Creating Interculturality. English Language Teaching: An Intercultural Dimension 李 欣 欣 Cindy Lee. DEZVOLTAREA RESURSELOR UMANE 2007-2013 Investeşte în oameni ! Fondul Social European PROGRAMUL OPERAŢIONAL SECTORIAL DEZVOLTAREA RESURSELOR UMANE 2007-2013.